While living and traveling in France and Belgium, I have purchased and used several Belgian and French and tablecloths; with napkins, placemats and runners to match or for contrast. As I have used them I discovered that there is justification for buying quality products from an economic point of view, from an ease of use perspective, and from a decorative perspective. I have already written about purchasing quality French table linens and of course that applies to French tablecloths as well. Quality fabric, design, color and hemming are all significant considerations. For tablecloths alone, however, there are a few additional concerns to be aware of. These are size of the tablecloth, shape of the tablecloth and design of the tablecloth as well as the purpose of the tablecloth; whether for dining or occasional tables. A large variety of French tablecloths are available in our e-store. Normally, a French tablecloth for a dining table should be the dimension of the table itself plus enough extra to allow a 15 inch drape on all sides of the table. This is so that there is sufficient fabric to drape attractively around the table without having so much fabric that it bunches up in the diner’s laps during meal time. Most people will purchase their tablecloths with that in mind, however given the fact that many tables come either in very large sizes or in unusual shapes it is sometimes necessary to allow for other considerations. In addition, it is sometimes interesting to combine tablecloths and placemats or runners to add dimension and interest. In fact it is possible to use napkins in the same manner. For example if you have an extra long table with a square tablecloth you can cover the extra settings with either runners or placemats that match or contrast with the tablecloth. The shape and use of a table can have some influence on your choice of tablecloth. Clearly square or rectangular tablecloths will be used on square or rectangular tables, just as round or oval tablecloths will be used for round or oval tables. However I have used square tablecloths on both round and oval tables with good effect. For the oval table, I place the tablecloth on the diagonal so that corners are on each end and on the sides. If there is a place setting or two that need covering I simply add a place mat. With the possibility of matching, complementary or contrasting runners, placemats napkins, and underskirts even the most unusual table can be attractively set and protected. 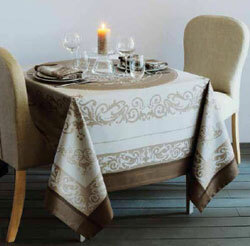 The design and color of the tablecloth is something that is really dependent on the individual and the occasion. For formal occasions, either solid color or subdued prints are normally chosen but that is no longer as rigidly held to as it once was. Our informal way of life has added more flexibility and creativity to our choices. For the more casual meals I love to see a touch of whimsy displayed. Using the tablecloth as a backdrop for your china, flatware, serving pieces and center pieces is one approach to choosing the tablecloth or perhaps you want to choose your china, flatware and other items to complement the tablecloth. Your own creativity will be your best guide. All this is a lot to think about and in today’s hurried and over-scheduled life. Why should we bother? Well, I believe there are two considerations, first there is the need to protect the table and second there is the need to create an attractive, peaceful and congenial place for your meals. Protecting the table is basic. If you have given time and money to choose a beautiful piece of furniture it is important to protect the finish, and that is the purpose of table linen. The use of table linen reduces the likelihood of scratching and marring the table top. But perhaps the most important reason of all is that having an attractive and peaceful place to eat is much more healthful than grabbing something and gobbling it down over the kitchen sink. Research has shown that if people sit and eat their meals slowly, savoring the flavors of the food, enjoying the company of others without the annoying intrusion of TV or other distractions, they eat more healthfully, digest their food more thoroughly and gain the best benefit for their bodies and for their souls. All-in-all a good investment of effort, I think. 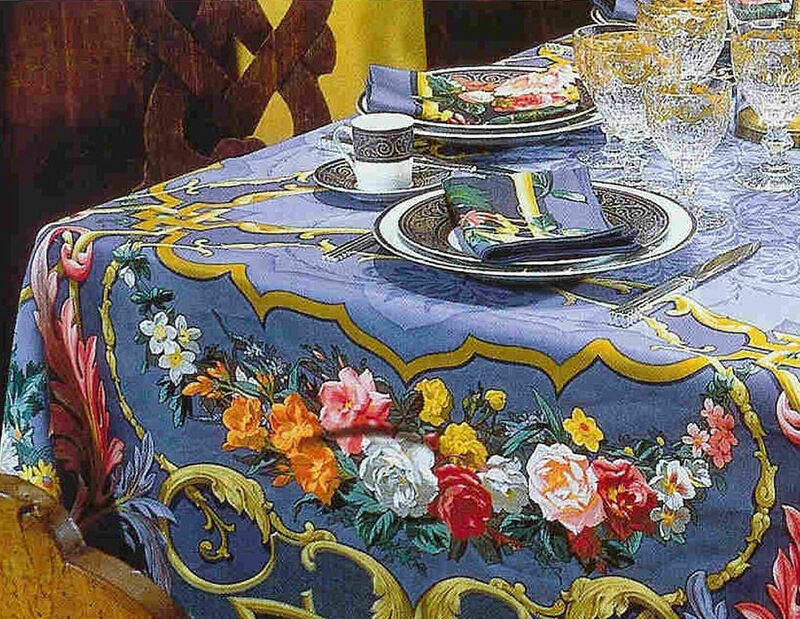 Please visit our e-store to see our French tablecloth selection.